What caused the largest glaciation event in Earth's history, known as 'snowball Earth'?Geologists and climate scientists have been searching for the answer for years but the root cause of the phenomenon remains elusive. 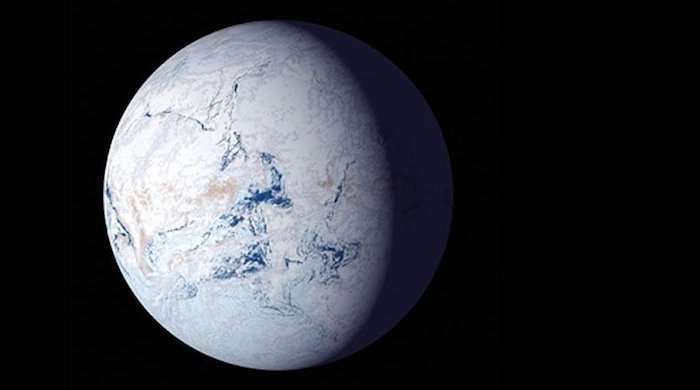 Researchers have pinpointed the start of what's known as the Sturtian snowball Earth event to about 717 million years ago—give or take a few 100,000 years. At around that time, a huge volcanic event devastated an area from present-day Alaska to Greenland.Coincidence? "We know that volcanic activity can have a major effect on the environment, so the big question was, how are these two events related," said Macdonald, the John L. Loeb Associate Professor of the Natural Sciences. At first, Macdonald's team thought basaltic rock—which breaks down into magnesium and calcium—interacted with CO2 in the atmosphere and caused cooling. However, if that were the case, cooling would have happened over millions of years and radio-isotopic dating from volcanic rocks in Arctic Canada suggest a far more precise coincidence with cooling. "It is not unique to have large volcanic provinces erupting," said Wordsworth, assistant professor of Environmental Science and Engineering at the Harvard John A. Paulson School of Engineering and Applied Science. "These types of eruptions have happened over and over again throughout geological time but they're not always associated with cooling events. So, the question is, what made this event different?" Geological and chemical studies of this region, known as the Franklin large igneous province, showed that volcanic rocks erupted through sulfur-rich sediments, which would have been pushed into the atmosphere during eruption as sulfur dioxide. When sulfur dioxide gets into the upper layers of the atmosphere, it's very good at blocking solar radiation. The 1991 eruption of Mount Pinatubo in the Philippines, which shot about 10 million metric tons of sulfur into the air, reduced global temperatures about 1 degree Fahrenheit for a year. Sulfur dioxide is most effective at blocking solar radiation if it gets past the tropopause, the boundary separating the troposphere and stratosphere. If it reaches this height, it's less likely to be brought back down to earth in precipitation or mixed with other particles, extending its presence in the atmosphere from about a week to about a year.The height of the tropopause barrier all depends on the background climate of the planet—the cooler the planet, the lower the tropopause. "In periods of Earth's history when it was very warm, volcanic cooling would not have been very important because the Earth would have been shielded by this warm, high tropopause," said Wordsworth. "In cooler conditions, Earth becomes uniquely vulnerable to having these kinds of volcanic perturbations to climate." "What our models have shown is that context and background really matters," said Macdonald. The eruptions throwing sulfur into the air 717 million years ago weren't one-off explosions of single volcanoes like Pinatubo. The volcanoes in question spanned almost 2,000 miles across Canada and Greenland. Instead of singularly explosive eruptions, these volcanoes can erupt more continuously like those in Hawaii and Iceland today. The researchers demonstrated that a decade or so of continual eruptions from this type of volcanoes could have poured enough aerosols into the atmosphere to rapidly destabilize the climate. "Cooling from aerosols doesn't have to freeze the whole planet; it just has to drive the ice to a critical latitude. Then the ice does the rest," said Macdonald. "It's easy to think of climate as this immense system that is very difficult to change and in many ways that's true. But there have been very dramatic changes in the past and there's every possibility that as sudden of a change could happen in the future as well," said Wordsworth. "This research shows that we need to get away from a simple paradigm of exoplanets, just thinking about stable equilibrium conditions and habitable zones," said Wordsworth. "We know that Earth is a dynamic and active place that has had sharp transitions. There is every reason to believe that rapid climate transitions of this type are the norm on planets, rather than the exception." At last, an explanation for the Cryogenian glaciation. Once started, it persisted for nearly a hundred million years. This is a demonstration of strange attractors in climate; it's a serious caution for climate deniers. Not that they're paying attention, they're not capable of imagining a hundred million years, 6000 seems to be about their limit. Uh huh, and how did the snowball Earth end? Well, once you stop precipitation, as would happen on a snowball Earth, volcanic eruptions also cause C02 to build up over time with no effective mechanism to remove the gas from the atmosphere. Over millions of years the C02 builds up to levels where it reverses the deep freeze conditions. Imagine all that heat due to CO2 and the planet did not cook. In fact, you're actually correct, after a fashion. In a sense they did "switch" according to this theory, but only insofar as we're not talking about the same volcanoes over time. If you had actually read the article (or the paper it's based on) you would have noted that the volcanoes that are hypothesized to have triggered the snowball Earth event would have been in a volcanic province particularly rich in sulfur-rich sediments, hence the cooling effect. These would also have released C02 of course, but in THEIR case the cooling would have been the dominant effect. Look up "cap carbonates" to find out what happened to all the CO2 after the glaciation. Where was the continent of Antarctica during the Snowball Earth epoch? Were all the continents still part of Pangaea then? I think a land mass at one of poles my have a large influence on moderating our planet's climate. Nope, Pangaea wasn't even yet a glimmer in its papa's eye. This was the time of the super-continent Rodinia.